The automatic climate control system maintains the interior temperature you select. The system also selects the proper mix of heated or cooled air that will as quickly as possible, raise or lower the interior temperature to your preference. 2. Adjust the interior temperature using the driver’s side or passenger’s side control switch. 3. Press the ON/OFF button to cancel. Press the (recirculation) button and switch the mode depending on environmental conditions. Recirculation Mode (indicator on): Recirculates air from the vehicle’s interior through the system. Fresh Air Mode (indicator off): Maintains outside ventilation. Keep the system in fresh air mode in normal situations. If any buttons are pressed while using the climate control system in auto, the function of the button that was pressed will take priority. The AUTO indicator will go off, but functions unrelated to the button that was pressed will be controlled automatically. To prevent cold air from blowing in from outside, the fan may not start immediately when the AUTO button is pressed. Once you have set the desired temperature, do not use the temperature control switches more than necessary. Doing so may delay the time it takes to reach the set temperature. If the interior is very warm, you can cool it down more rapidly by partially opening the windows, turning the system on auto, and setting the temperature to low. Change the fresh mode to recirculation mode until the temperature cools down. When you set the temperature to the lower or upper limit, Lo or Hi is displayed. 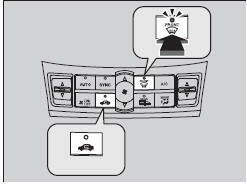 Pressing the ON/OFF button switches the climate control system between on and off. When turned on, the system returns to your last selection. Pressing the button turns the air conditioner system on and automatically switches the system to fresh air mode. Press the button again to turn off, the system returns to the previous settings. For your safety, make sure you have a clear view through all the windows before driving. Do not set the temperature near the upper or lower limit. When cold air hits the windshield, the outside of the windshield may fog up. 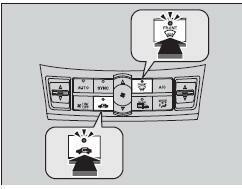 If the side windows fog up, adjust the vents so that the air hits the side windows. After defrosting or defogging the windows, switch over to fresh air mode. If you keep the system in recirculation mode, the windows may fog up from humidity. This impedes visibility.